The average spend on everyday items has been broken down in a new report from the Office of National Statistics (ONS). See also: Are essentials like food and fuel costing you more? The report covers a huge range of expenditures, including food, transport and education - totalling an average of £528.90 a week. Transport and housing come out as the biggest expenses, but we've delved into the food and drink figures to show you not just what we're buying as a nation, but also how much we're spending on it all. Obviously we're spending more on some products than others. We're a country that loves carbs. Bread and biscuits – combined with pasta and rice, add up to £9 a month in total. We spend more on fish than any type of meat, while some items are costing us less because they're generally quite cheap – eggs, tea and coffee for example. This doesn't necessarily mean food costs more or less in the different areas. Higher disposable income in the South East will account for some of the increased spend in this region. The subtle manipulation starts as soon as you enter the store when you are assailed by the smell of flowers and fresh bread, which are often placed near the door. The smell is intended to put you in a good mood and to get your salivary glands working. You are also more likely to pick up these higher-ticket items when your cart is empty. 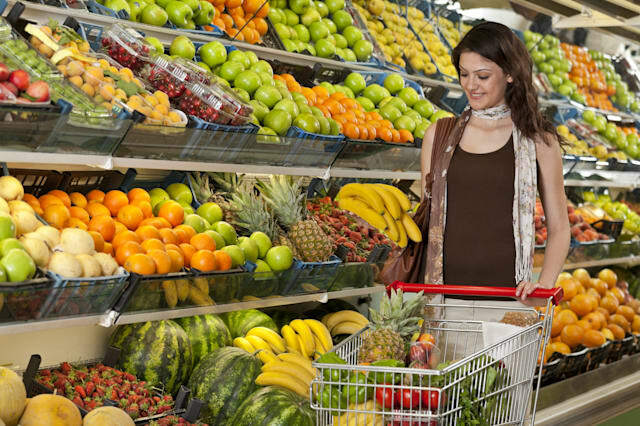 Similarly, fresh produce like fruit and vegetables (one of the most profitable sections at the supermarket) is also usually at the front because the bright colours are more likely to lift your mood than bland cartons and cans. Mist is sometimes sprayed on the fruit and veg to make them look fresh but can actually make them rot faster. Supermarkets do their best to spread staples far apart to force shoppers to walk through the whole store and lead them into temptation (meat in the back right hand corner, dairy in the back left hand corner). In most stores customers move from right to left. Some speculate this is because in many countries, including the US, people drive on the right. Also, most people tend to be right-handed so this feels more natural. "It is the left hand that pushes the cart, and the right hand that is our grabbing hand," says Underhill. Due to this flow, the things you are most likely to purchase tend to be on the right hand aisle while promotions on the left are designed to help shift the less popular goods. Pricier items are placed at eye height. The cereal aisle is a good example, where healthier cereal is at the top, big bags of oats and other bargain cereals are generally on the bottom shelf and more expensive, big-name brands are at eye level – easy to see and reach. Some items are deliberately placed at children's eye height, such as highly-advertised cereals. You cannot assume that items on sale at the end of an aisle are a good deal. Those endcaps are sold specifically to companies trying to promote a product, observes Underhill, consumer expert and author of What Women Want: The Science of Female Shopping. The music you hear is not just a random playlist. Dubbed 'Muzak,' it is carefully selected by an 'audio architect' who has analysed the store's demographic. Douglas Rushkoff, author of Coercion: Why we listen to what they say (1999), says grocery shoppers respond best to Muzak that has a slower tempo, making a whopping 38% more purchases when it is played overhead. By contrast, fast-food restaurants use Muzak that has a higher number of beats per minute to increase the rate at which a person chews. There are 74 Muzak programmes in 10 categories, ranging from indie rock to hip-hop and classical, which are mapped out in 15-minute cycles that rise and fall in intensity using a technique known as 'stimulus progression,' writes Martin Lindstrom, marketing consultant and author of Brandwashed: Tricks Companies Use to Manipulate Our Minds and Persuade Us to Buy. Shopping carts are getting bigger because research shows that consumers buy more when they can fit more in the cart. Multi-packs are also getting bigger, because the more people buy, the more they tend to consume. If you used to buy a six-pack of coke and drink six cans a week but now buy a 12-pack because that's the new standard size, you're probably going to start drinking 12 cans a week, Jeff Weidauer, former supermarket executive and vice president of marketing for retail services firm Vestcom, told Reader's Digest. Customers think that when they buy in bulk, they get a better deal. But that's not always the case. Work it out yourself, and only buy as much food as you can eat before it goes off. Supermarket pricing is often described as a "dark art". Are offers like 'Was £3, Now £2' or 'Half Price' genuine? In Britain, supermarkets have been caught out on putting up prices shortly before discounting them heavily. The Office of Fair Trading clamped down on 'yo-yo pricing' and eight major supermarkets (Aldi, Co-Op, Lidl, Marks and Spencer, Morrisons,Sainsbury's, Tesco and Waitrose) signed up to a set of principles drawn up by the watchdog in late 2012. The principles also say that pre-printed value claims such as 'Bigger Pack, Better Value' must be true. However even with those principles, the question is whether products were ever priced realistically. Two for one offers are a money illusion, as you may end up buying more than you need. The Office for National Statistics does not include two for one offers in its inflation numbers on the grounds that they are not a genuine discount, as consumers may not have wanted the second item. Another well-practised trick is to make promotions very specific and put the sign next to a full-price item. Often customers get confused and end up grabbing the wrong item. Lindstrom says the average consumer tends to remember the price of only four items: Milk, bread, bananas, and eggs. They often don't have the faintest idea whether they are getting a good deal or not. But the bulk of what shoppers buy they buy every week. So if you are really methodical and keep your old receipts, you would know when something is on sale and stock up then. If you have a store loyalty card, supermarkets track your spending and send you targeted vouchers through the post to remind you to shop and purchase certain brands. This can work in your favour if you were going to buy them anyway, but might prompt you to buy something you didn't really want or need. Watch out for 'speed bumps' of goods that go together – for example seasonal displays such as a bunch of Halloween-themed items - in aisles or at entrances. Sample stations along with recipes also slow you down and give you a taste of new products or lesser-known foods such as kale. Mobile displays, LED lighting, floor graphics, ceiling hangers or digital or video marketing are other common marketing tricks. Chocolates and other sweets have long adorned checkout counters where bored kids are nagging their parents to buy them a treat. Supermarkets have come under pressure from the government to move chocolate away from checkouts and some have responded. Lidl has justbanned sweets and chocolate bars from the checkout of its 600 UK stores and vowed to replace them with dried fruit and oatcakes. Sainsbury's has a policy of no confectionery next to checkouts in its supermarkets, but not in smaller convenience stores, similarly to Tesco.